(Nanowerk News) When it comes to designing extremely water-repellent surfaces, shape and size matter. That's the finding of a group of scientists at the U.S. Department of Energy's Brookhaven National Laboratory, who investigated the effects of differently shaped, nanoscale textures on a material's ability to force water droplets to roll off without wetting its surface. These findings and the methods used to fabricate such materials—published online October 21, 2013, in Advanced Materials ("Robust Superhydrophobicity in Large-Area Nanostructured Surfaces Defined by Block-Copolymer Self Assembly")—are highly relevant for a broad range of applications where water-resistance is important, including power generation and transportation. Mimicking this self-cleaning mechanism of nature is relevant for a wide range of applications, such as non-fouling, anti-icing, and antibacterial coatings. However, engineered superhydrophobic surfaces often fail under conditions involving high temperature, pressure, and humidity—such as automotive and aircraft windshields and steam turbine power generators—when the air trapped in the texture can be prone to escape. So scientists have been looking for schemes to improve the robustness of these surfaces by delaying or preventing air escape. 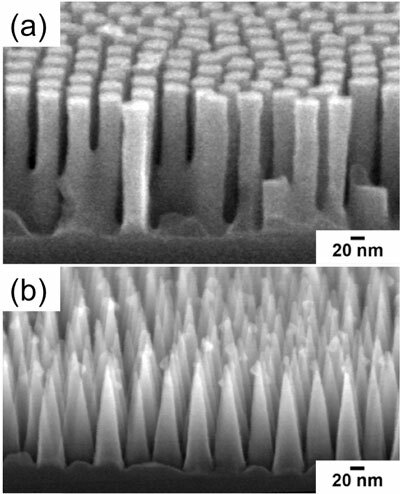 Side view scanning electron microscope image of a silicon surface textured with (a) cylindrical pillars and (b) nanocones. "In principle, the high robustness required for several applications could be achieved with texture features as small as 10 nanometers because the pressure needed for liquid to infiltrate the texture and force the air out increases dramatically with shrinking texture size," explained Checco. "But in practice, it is difficult to shrink the surface texture features while maintaining control over their shape." "For this work, we have developed a fabrication approach based on self assembly of nanostructures, which lets us precisely control the surface texture geometry over as large an area as we want—in principle, even as large as square meters," Checco said. High-speed video of droplets bouncing off a surface textured with nanocones. The scientists created and tested new materials with different nanoscale textures—some decorated with tiny straight-sided cylindrical pillars and some with angle-sided cones. They were also able to control the spacing between these nanoscale features to achieve robust water repellency. The nanopatterning technique used in this study also enables the design of a wide variety of materials with different texturing—and therefore different water-repelling properties—on different parts of a single surface. This approach could be used, for example, to fabricate nanoscale channels with self-cleaning and low fluid friction properties for diagnostic applications such sensing the presence of DNA, proteins, or biotoxins. "This result is an excellent example of the type of project that can be done collaboratively with the DOE's Nanoscale Science Research Centers," said Black. "Previously, we have been pursuing similar structures for an entirely different scientific purpose. We are happy to work with Antonio through the CFN User program to help him accomplish his research goals."